What do bitcoin miners do all day long? Long story short, miners literally search for needles in haystacks. The haystack changes in size every 2 weeks depending on how fast or slow each needle is found. Let’s start from the beginning. A node is the bitcoin software that forms the backbone of the bitcoin network. Full nodes contains the entire history of all bitcoin transactions, ~ 70Gb at this time of writing, and constantly run rules validating transactions such as; has this bitcoin been spent before, are each transactions (in bytes) is less than MAX_BLOCK_SIZE and are the transaction’s syntax and data structures correct. See the protocol rules for more info. On a side note, there are different flavoured nodes. Core, XT, Classic and Unlimited. Why? I’ll leave that discussion to another article. A miner is a piece of code on a computer that collects all unconfirmed transactions (the coffee you bought 5 minutes ago with bitcoins), packages it up into a “block” and attempts to have it added as the next block on the block chain. Once something is on the block chain, it is regarded as verified and has “cemented” it’s place in history. I’ve left out a bit on confirmations that you can read about here. What is the link between a node and a miner? There are different variations but at a simplistic level, here is a workflow scenario. Nodes collect and validate unconfirmed transactions. Ie making sure the coffee you purchased with bitcoins is legit. Miners then grab a bunch of these unconfirmed transactions, orders them how they please (usually in order of highest fees to lowest fees) and then sends it back to the node to get it accepted onto the blockchain. The node then checks the received block and if all the validation passes, it will relay this to other nodes and have the transactions accepted and confirmed. That sounds easy! What’s the catch? The catch is that there are ~5000 other miners around the world doing the same thing. How does a node know which miner to accept the block from? 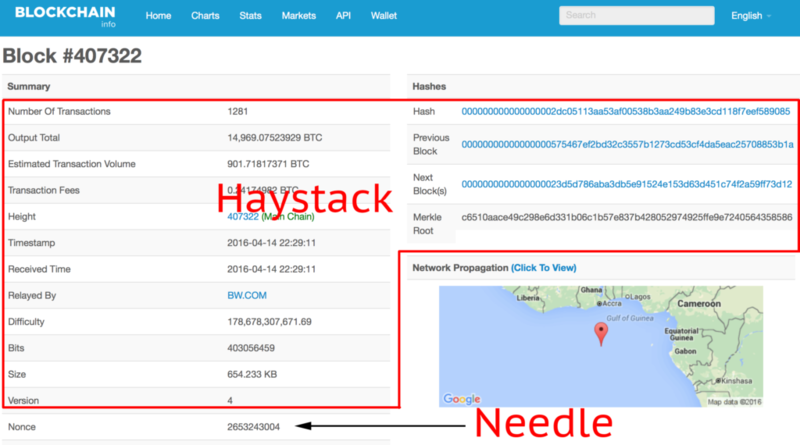 This is where, metaphorically, the node chucks a needle into the haystack and says, I’ll accept the block from the first miner who finds the needle. In addition to this, you’ll get a reward of 25 BTC for your efforts. (Note the reward started at 50 BTC and halves every 4 yrs). This is what is commonly referred to as mining. There is a rule in place that says on average, it should take ~10 minutes to find this needle. Over time as technology has progressed, some miners find the needle pretty quick using new technologies such as with magnifying glasses or specially designed sieves or even building robots to help out. There is a feedback loop in the algorithm that looks at the average time the needle is found in the last 2 weeks and adjusts the size of the haystack, making it bigger or smaller to keep the time around 10 minutes. Is this analogous to the CPU -> GPU -> FPGA -> ASIC technology employed by miners since 2009. Is anything achieved by searching for the needle? Nope. Nothing. Zilch. It’s just a meaningless, tiresome, resource intensive and mundane task that is however important to determine which miner’s block to accept. This is also known as Proof Of Work (POW). Not Prisoner Of War. Here you can see I’ve got the needle which is called the Nonce. A random number that satisfies the required mathematical equation. I’ll simulate manually how nodes confirm if the needle is in fact correct. It is pretty straight forward once you get the hang of it. 6 fields are needed which I’ve grabbed from the above link. The idea is that the double hash of the above data needs to be below the specified target which is represented here as the Bits field. The first step is to convert any non-hex data to hex. This next bit is the trickiest. The order of the digits are juggled around just to keep everyone on their toes. The version needs to be represented in Little Endian format. ie from 00000004 to 04000000. Same with the Time, Bits and Nonce field. The hashPrevBlock and hashMerkleRoot needs to have it’s order swapped as well. becomes: 1a3b850857c2eaa54dcf53cd73127b55c332bdf27e4675050000000000000000 and the same with the hashMerkleRoot. Hang in there with me. We’re almost there! Let’s list out the final data to hash. The final step is to again flip this back the other way to have the zeros at the front. Miners are a very important part of any crypto currency ecosystem. They work 24 by 7 to help perform various tasks such as (but definitely not limited to) building block, nominating that their block should be the next block in the block chain by proving that they did some labour intensive work and in general, help the flow of transactions through the network. Without miners, there would be no bitcoins. Try this: echo -n hello |openssl dgst -sha256 -binary |openssl dgst -sha256 as an example. You want to hash the binary output of the first sha256, not the hex representation.